The Minnesota Department of Natural Resources wants to dramatically increase the waterfowl population in the state. For that to happen, the DNR says the number of acres of wetlands and grasslands in the state needs to increase dramatically. On Friday the DNR unveiled a plan that would do just that. And while environmentalists welcome a move to improve the natural areas in Minnesota, they say the state needs to first concentrate on the areas that are in danger of dissapearing. St. Paul, Minn. — To assess the health of Minnesota's waterfowl population, you don't have to pour over pages of environmental data. Just talk to a duck hunter and they'll tell you the number of ducks in Minnesota is down. "As duck hunters out in the field, we see that something's changed rather rapidly in the past 10 to 20 years. And so our concerns are what happening to the duck population," says Lance Ness, a duck hunter and head of the Fish and Wildlife Legislative Alliance, a group that lobbies for a conservationists and hunters in Minnesota. Ness says he knows why hunters are seeing few ducks and waterfowl these days; their habitat is in terrible shape. "We might be the land of 10,000 lakes, but if the land of 10,000 lakes are 10,000 dead lakes or 10,000 lakes that aren't very good, ducks just aren't going to come here," says Ness. Researchers agree. They say ducks that over the years would've have flown down across Minnesota from Canada on migratory flyways, are now choosing to travel a few hundred miles to the west, across North and South Dakota. The DNR's Ray Norrgard says fewer ducks want to spend much time in Minnesota, and raise their duck families here, because the habitat is no longer ideal. "And we relate that to the reduction and quality of shallow lakes, loss of water clarity affecting the submerged vegetation in those lakes which is relate to invertebrates and other important foods for ducks," according to Norrgard. There are several reasons for that loss of habitat, but intense farming practices and even more intense development carry much of the blame. Citing the importance of ducks and other waterfowl to the economy, hunters bring in over $200 million to the state each year, and the environmental importance of Minnesota as a migratory flyway, the DNR has unveiled a plan to improve waterfowl habitat. In the next several decades the DNR wants to set aside or restore two million acres of prairies and wetlands. The DNR hopes that means one million ducks will call Minnesota home in the fall, that number is about 600,000 now. And in the spring those ducks will produce some 1.4 million ducklings. Environmentalists say they are pleased to hear state officials talk about preserving natural areas regardless of the use. But they also say there's a lot to be done before the state can add more acres of wetlands and grasslands. 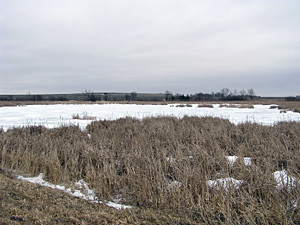 Tom Landwehr, with the Nature Conservancy in Minnesota, says before the state can add wetlands, it needs to improve the ones that are still around. "The fact is if you look at the state of our environment as represented by wetlands, they're in much worse shape today then they've ever been," according to Landwehr. "There's fewer of them, they're more degraded, the outlook for them is not good, and the settings that they're in are not good. So you look at the landscape around wetlands right now and it's in a state of disrepair as well." Landwehr is upbeat about the DNR's proposal. He says if the state improves habitat for waterfowl, all of the state's wildlife will benefit. There's no cost attached to the plan yet, but DNR officials say it would exceed $1 billion. Gov. Pawlenty is in favor of the effort and announced a $187 million bonding package that could help fund the project. Pawlenty will ask for the money from the Legislature this spring. The DNR says they hope to get $15 million to restore waterfowl habitat if the bonding goes through.